Community cooperative galleries i.e. 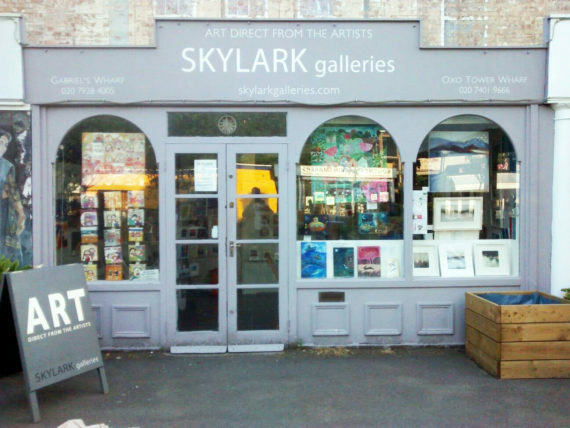 Skylark Galleries in London. This blog follows my recent post on Commercial Art Galleries that explained some of the pros and cons of the established commercial retail art world. I got carried away with the difficulty of publisher-run commercial chains and I did not say much about a different sort of retail art gallery. I am talking here about an artist’s collective or co-operative gallery. Basically the collective idea is that a group of artists get together and take on retail premises where they share spending and workload. They cut out the middleman and save costs. They look after the gallery in turns and meet their public face to face. They get direct feedback from visitors, and the public actually meet real artists. The artists each get a bigger percentage of their sales income. It seems like a win-win situation. And it is, when it works well. However it can go wrong. Artists are very difficult to organize. Someone once said that it is like herding cats. Maybe it is because we have very individual creative brains. Or maybe not. If an artist wishes to go down this road it would be a very good idea to create a group of artists that had something else in common. It needs something that can hold them together rather than just the commercial incentive. If a group can get together, and they can agree on a plan, it might go like this. Try it out by booking an exhibition occasion in one of the for hire pop-up gallery spaces. Just a week long. Share the wall space, and share the workload. See if you get along together. See who has natural leadership qualities and who is a good follower. And discover who is just a dead weight. See who has got an established collector list and whether they are willing to share it. Try it out again for a bit longer in another pop-up gallery. Share the costs and share the workload. But the second time this will need more publicity and various serious attempts to get in new collectors. Try booking more pop-up shows for the future. See who is willing to commit and cough up cost payments in advance, and who is not. Find out who is good at direct contact selling and who is not. Eventually after developing a cohesive efficient group maybe look for empty side street premises where you can create a permanent gallery for the group. A side street is going to be a lot less expensive. Realise that many other art galleries actually make a loss on their art sales. Instead they make their profit on picture framing or other design products like cards or jewellery. Can you also involve a picture framer, or designer product maker? There are galleries that rely on attracting a changing passing public, and those that build up a slow relationship with collectors. Holiday destinations fit the first type. Choose carefully based on the kind of work that artists in the group create. Ideally aim for both audiences. This has been done before. In London on the Southbank, about half way between the Tate Modern and the London Eye, there are a couple of artists run galleries. Skylark One Gallery and Southbank Printmakers are in Gabriel’s Wharf. Next door in the Oxo Tower is Skylark Two. Their early history might not be as outlined above but the working model is the same. Basically the artists share the costs and workload. They get a much higher percentage of income from sales of their artwork. The gallery business gets a smaller percentage of sales income because all the member artists put an agreed amount into the pot every month. Skylark One is open 364 days a year and has 14 artists so that each artist looks after the gallery once a fortnight. The space is shared out so that each artist gets a little over one metre wide wall space. That means that the work on display is small to medium size. 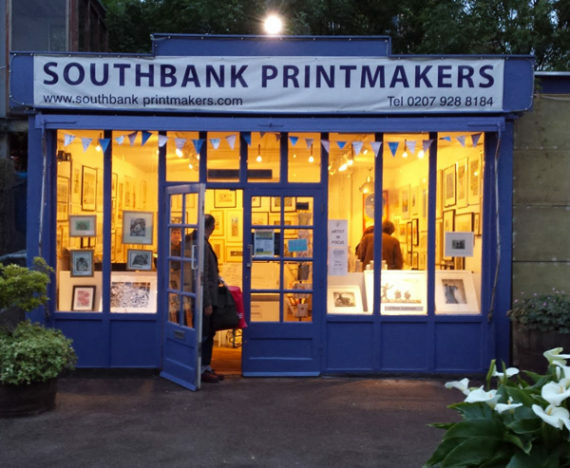 In Southbank Printmakers there are even more artists, about 40, so artist members attend the gallery less frequently at once every 5 weeks. With this many artists wall space is rationed to two framed prints, and another 4 or 5 unframed in the browsers. 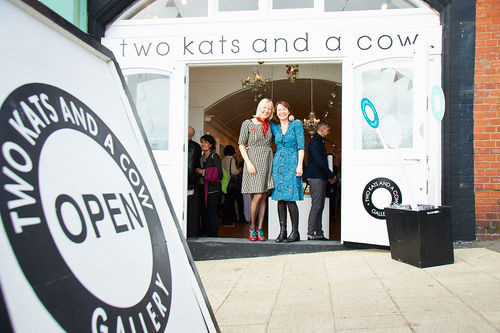 Another example is Two Kats and a Cow Gallery on Brighton seafront. This very successful gallery has been going since 2001. It started as a shared studio but later became an exhibition space for the three artists. The most obvious advantage for a group of only three artists is that each artist gets much more wall space enabling them to show a wide range of sizes, prices, and genre. Two Kats and a Cow have become well known and are now able to employ a gallery manager. 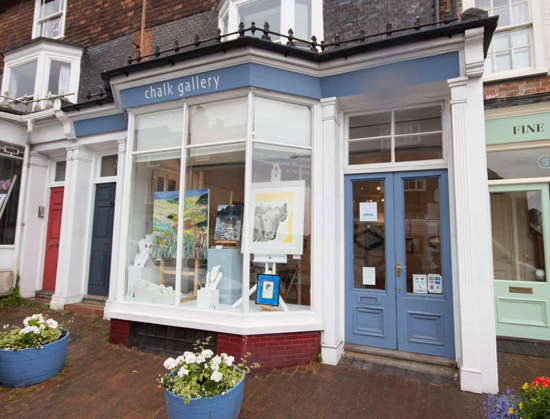 The Chalk Gallery in Lewes Sussex is another successful example. Their website is also very informative if you go to the ‘call for artists’ page and click on the link for details of the submission process. They have 21 artists who share the space, attending the gallery once every three weeks. Here are links to these examples. There are many others.